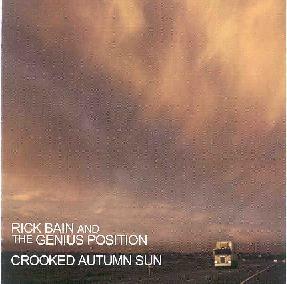 Rick Bain and the Genius Position - "Crooked Autumn Sun"
Portland, Oregon sure does seem to be a hotbed of psychedelic pop bands. King Black Acid and The Helio Sequence have been featured in Aural Innovations, and though I've yet to hear them I understand the Dandy Warhols fit the mold. And now we have Rick Bain and the Genius Position. Early Pink Floyd pop-psych and the Beatles are apparent throughout, but the band rocks hard too with a combined talent for melody and intensity. Both retro and modern, the band manage to create accessible songs that have the added benefit of being backed by a gorgeous psychedelic sound. The band consists of Rick Bain on guitar and vocals, Michael Ford on drums, Joe Kaczmarek on organ, and Eric Pfau on bass. Crooked Autumn Sun is their debut CD. Not all of the 14 tracks on this album grabbed me, some being well written but unmemorable. But the ones that worked, worked well. Among the highlights is "Three Chord #1". Strained weaving guitar lines and trippy organ give the music it's pop-psych edge. The full band sound is heavy with a slight drone, though the organ lines and gorgeous paisley slide guitar licks are easily heard. "Lovin' Yummy" is a crashing rocker with a Beatles feel during the guitar solo. I love the organ's participation in the heavy parts which gives the music a beautiful 70's feel. On "Orlando", once again the organ embellishment and Beatlesque guitar licks go a long way toward giving the song it's power. "You Are Still" is a standout track that opens with a cool combo of freaky noodling sounds that leads into an oh-so-simplistic but beautiful 60's pop flowery psych tune. But there's power to the song as the organ propels it into more modern and heavier rocking times. An excellent track. "So Good" is similar, but not as powerful. And "Linear High" is another potent pop-psych rocker I enjoyed. Really good songs. But I'll be damned... these guys can also throw structure out the window and jam. The trio of "Assume The Position Part I", "Magic Horse", and "Assume The Position Part II" feature the Genius Position tripping out and exploring the cosmos a bit. "Assume The Position Part I" is a simple but mucho cool bluesy tripped out psych journey. But "Magic Horse" is the most spaced out track on the disc. Cosmic wailing guitars and totally Rick Wright Floydish organ. Then as if inspired by the Pink Floyd influences of "Magic Horse", for "Assume The Position Part II" the band let their hair down and keep the journey firmly in space. Quite nice. In summary, Rick Bain and the Genius Position will appeal to fans of well written songs with a firm psychedelic influence. Love that organ. If you're in Portland and a committed King Black Acid concert goer then you'd do well to eyeball the papers for a Rick Bain performance. You can visit Rick Bain and the Genius Position at their web site. Contact via snail mail c/o Official Records; 1539 W. Burnside; Portland, OR 97209.